Mudeford Sandbank & entrance to Christchurch harbour, Dorset. Hi Clipper - yes, absolutely, the entrance to Christchurch Bay, and a lovely bit of sea. Not far away from you either. Nari and Yves, good try, but you were going the wrong way down the coast. Re Olau - I only have great memories of that service, it was so convenient and comfortable. One by one we've seen the number of North Sea routes diminish to the point that we now only have Harwich to Hoek, Hull to Europoort and Zeebrugge. Long gone are the days of more choices of routes to Holland, Germany and Scandi. So ... where are you going to take us Clipper? Mmmm, tricky. I'll see if I can dig something out from the archives. If more than a few days pass, then by all means someone else please take my turn. And some years ago I got the bus from Bungay to Great Yarmouth, then the local bus down to the quay somewhere (can't think where it was now) and there was the Norfolk Line cargo boat waiting. 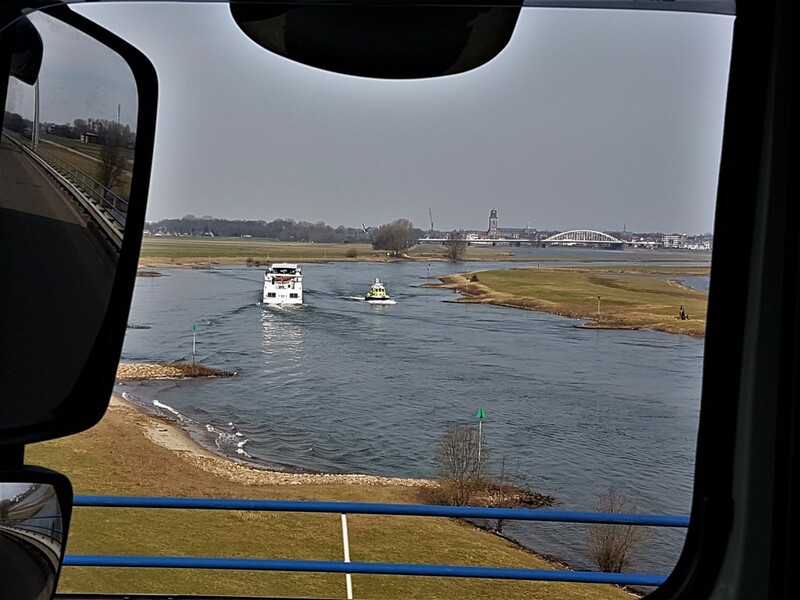 It took up to 12 passengers and we went across to Schevingen. I mentioned this somewhere else on the forum, I know, but it's just something I'd so love to be able to do now. Never forgotten. To save me trawling through the topic, are there any constraints? Does it have to be coastal? No rules or constraints Clipper. Ralf, Yves and I possibly tend to find obscure places relatively close to home, Thijs tends to find places that are within a stone's throw (he can throw a stone quite a long way) of a lorry park, Ivy will have us anywhere in the galaxy, and Ombugge typically has us up a south east Asian creek without a paddle! No need to have sea or coast - and it doesn't even need to be your photo. Go on - have a go - you'll be playing your part in keeping a global and diverse group of reprobates off the streets. Yes, do join in, Clipper. Join the rehabilitated reprobates! By the way, if you choose a photo that is not your own (nor family/friends) add a note that the photographer's name will be added when the puzzle is solved. This is just an attempt to avoid copyright problems. I must check back - I've a horrible suspicion that I missed doing that once or twice recently. This is a 19th Century photo of somewhere that is quite different today but still very recognisably the same place. If you know it, you should get it. Traditional first question;are we in UK? Hi Thijs. Yes we are indeed in Germany. Then i think it' s the river rheine somewhere between koblenz en holland. It's almost flat there. And you made a river cruise a few years back. I think that Thijs has nailed it (perhaps accidentally!) - it is Koblenz isn't it? Yes, this is Deutsches Eck, Koblenz. For anyone who doesn't know, this is the confluence of the Rhine and Moselle (Rhein and Mosel). Thank you Ralf - very informative. I was last there in 1980 before the statue was replaced. The 1993 version looks like it comprises some original and some new pieces. Is that correct? It may look so, but it is not. There were just a few small pieces left from the old statue and they were made in copper. Then there was a small model of the statue out of a museum in Koblenz. These were the references. The new scupture is made from bronze and it contains of 84 single pieces. They have different alloys, which explains the different look of the parts. The intention was, that the different parts should be visible. The Austrian sculptor Raimund Kittl received the order of the reconstruction by the publisher Werner Theisen in February 1989, so BEFORE the reunion of Germany. Theisen fought a long battle for the statue, he even went to the law court. 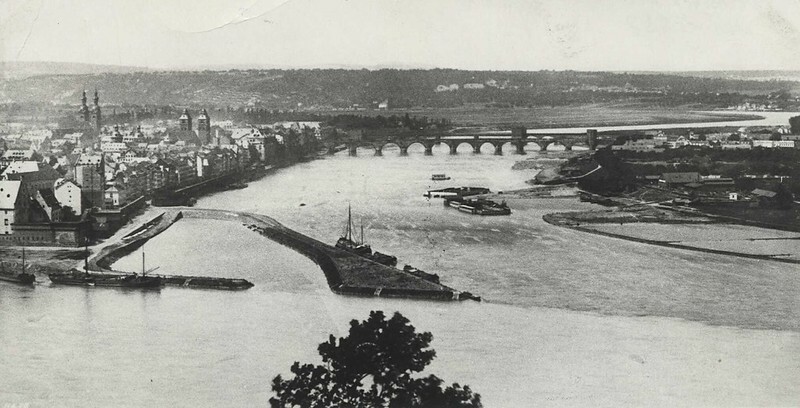 That was the reason for the federal state Rheinland Pfalz, to donate the area to the city of Koblenz, because only their citizens voted with big majority for the reconstruction. The rest of Germany had a different opinion: no honor for the German Empire again! For Koblenz however it is their most famous point of interest and is visited by masses of tourists each year. The new statue was finished in 1992 and transported by ship to Koblenz. She arrived there at the 16th of May 1992 and stayed in the port, since the city had not decided yet at that time to rebuild the monument. Now they had big pressure and so they decided at the 4th of June that the new statue will be accepted. But it took more than a year until the monument was completed at the 2nd of September 1993. Tragically Theisen died in May 1993, so he could not see the positive result of his long fight. Thank you for this puzzle, i did not know this story before and i am very glad to do now, because it is a good example how difficult it is for us Germans to handle our sad parts of the history. Thank you again Ralf. I'm just sorry to learn about Herr Theisen, who didn't live to see the realisation of his dream. Ralf, you have given a most moving account. I did not know anything of this, of course, but reading through it made me realise how difficult it was to make decisions that seemed right at the time and yet gave rise to a painful "Koblenz versus the rest" controversy. And yes, as you said, it is a good example of how difficult it is for Germans to handle the sad parts of your country's history. There must surely be similar episodes in the history of the British Empire, but I confess to ignorance of details. Many thanks for the account. You are welcome, Ivy! And thank you for your comment, which i as always appreciate. Anyways .... the honour bounces back to Mark. Bounces back to Thijs surely - he solved it, he just left a ? in his sentence! But driving at this moment, and can't upload images to cvf. So if you have any? i was sailing down the rhine to look for the arc bridge,meanwhile thinking if that bridge could be on the rhine anyway cause of the barges to pass. at a point i was already at the city Worms. no ,must be to far. went up to Koblenz if it could be the river Mosel. for a stupid reason i started west of Koblenz in search for the bridge,couldend find it there also. cause by that time looking for the buildings near the river. while Mark lays the ball to me, i had to make a image somewhere. so where is this somewhere.? To start somewhere: Arnheim again? Along the Nederrijn?